THIS IS A HUGE THANK YOU TO EVERYONE WHO HAD A PART MAKING OUR HARCOURT'S ART CHALLENGE AND THE BIG ARTS DAY OUT SUCH A SUCCESS! ​Linda Bigge - the curator and organiser of the Harcourt's Youth Awards. Linda did a great job of organising the art works from the schools and then displaying them so well in the competition area. Also in the 'Little Theatre' end of the Whangamata Hall where the folios were displayed. A huge thank you Linda for working away on your own to organise this we all really appreciate what you did. The sponsors - Harcourts, New World, Liquor King and The Lion Foundation. Then the entrants to the Harcourt's Arts Challenge and the stall holders who helped make the exhibition such a colourful event. The girls in the Pop Up Cafe - Margie Lucas and Janine Hill. The same Margie and Janine plus Sue Jamieson for organising the food for the Wine and Cheese. Carole Shepheard the judge. Kate Jones Madill our Patron. Terry Walker for once again giving freely of his time to help with various things including being the MC for the prize giving and being our licenced Bar Manager, Baz Ross & John Blomeley Barmen. Ngaire Leighton and Nikky Seales for putting together the 3 raffles. Finally all the extra helpers who came in the form of Dave and Helen Socich (collection and return of the carpeted stands from Pukekohe), David Collett the electrician who made our new lighting setup - he came and helped Malcolm Burt (Maree's husband) put the lighting together. Then kind husbands who helped set up and take down stands tables etc etc. Finally the great Committee we have - only 6 of us but we all work well together and have our own talents to help make these events a joy to take part in and view. Thank you all once again for a great show. The winner of the Harcourts Youth Award is Jasper Pickett for his work - 'Come Together' His mother Melissa McGregor is pictured accepting the award from David Haak and Paul Prouse of Harcourts Whangamata. The 2D category was won by Joanne Mahoney for 'Floral Fragments'. Joanne also received the Chris Amess, Arts Collective Whangamata, Supreme Award. The 3D category winner is Jocelyn Pratt for her 'Cloudburst' Pictured receiving her award - left to right Carole Shepheard (Judge), Paul Prouse, Jocelyn Pratt and David Haak. 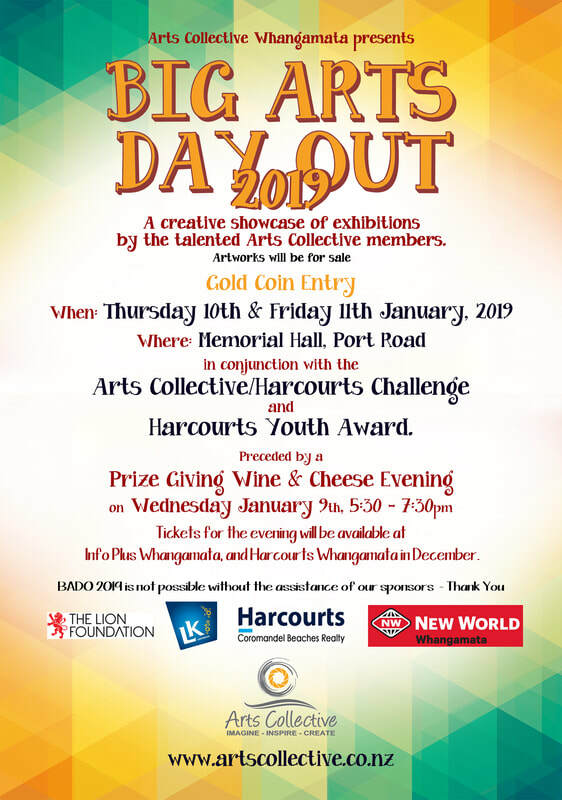 ​The “Big Arts Day Out” was held at the Memorial Hall, Port Road, Whangamata on Friday 5th and Saturday 6th January, 2018 in conjunction with the Arts Collective/Harcourts Challenge & Harcourts Youth Award. This was preceded by a Preview Wine and Cheese Evening on Thursday January 4th, 5:30 – 7:30 pm. Tickets were $10 each and were available at the Harcourts Coromandel Beaches, Port Rd, Whangamata office. Saturday 24 September 2016, 9am - 2pm. 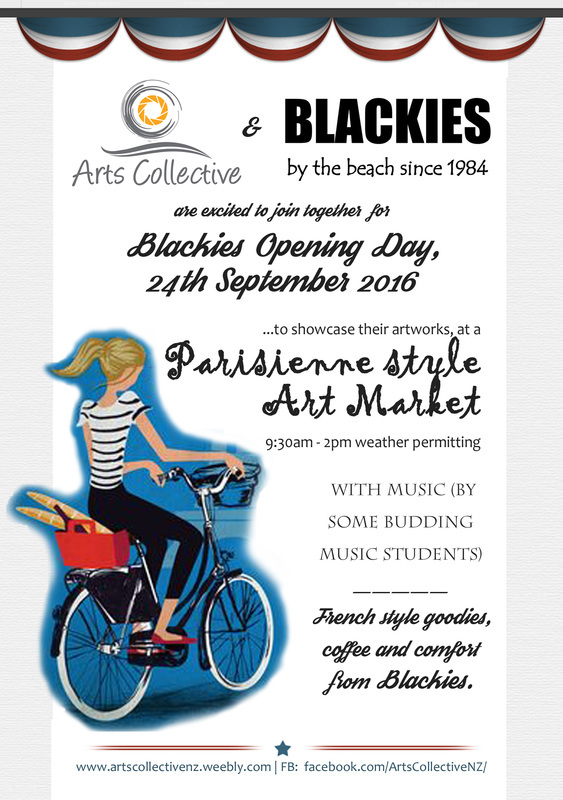 It's a Parisienne style French Market: art and music and French style goodies and coffee from Blackies. Wear your beret or garlic string and bring your art and easels to display and sell. We would love a vibrant colourful input from the Arts Collective. - Visual art only on this occasion, please book with Lynne 021487098 . - Artists are responsible for own setup and sales. Blackies can offer Cash out facility. - Set up at 8.30am. Provide own easels or table. - Space is available in the newly concreted area to left and in front of Blackies. Check with Lynne, Michelle, or other Arts Collective person, on arrival. - Event is weather dependent; Sunday is rain check day. Wear your beret or garlic string and bring your art and easels to display and sell. We would love a vibrant colourful input from the Arts Collective. Please note that your artwork that you display is of your choice - it doesn't need to be Paris or French themed.